Ladies, mark your calendars for 26 September 2018 and gather your BFFs for this month’s Girlfriends Getaway, which will be hosted at select Cine Prestige cinemas and Ster-Kinekor cinemas. The ladies-only event will feature the pre-screening of the mystery, thriller, A Simple Favour, and will be hosted at Blue Route, Brooklyn Mall, Cavendish, Cradlestone, Cresta, Eastgate, Gateway, Greenstone, Irene, Mall of Africa, Sandton, The Grove, Tygervalley and The Zone in Rosebank. Look forward to a girls’ night out and prepare to be wowed by the relaxing, luxurious, exciting and surprising activities that make Girlfriends Getaway the place hottest place to be! 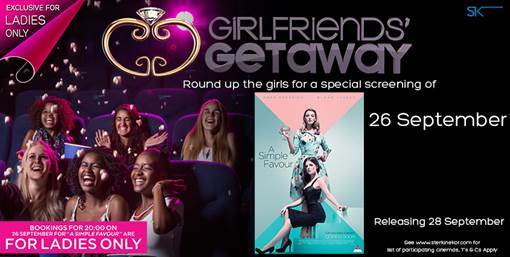 Because Ster-Kinekor understands that a girl can survive it all as long there is some beauty and treats, this month’s girlfriend getaway includes welcome drinks, delicious finger foods, gift bags & much more. The film will release nationally on 28 September 2018 at Ster-Kinekor cinemas. If you miss the event, you can still have the Cine Prestige experience. Relax in large, reclining, leather chairs and watch the A Simple Favor play out on the big screen. Choose a gourmet platter from a variety of options. Treat yourself to delicious coffee and cake, a soft drink and freshly-popped popcorn! A Simple Favour follows three small-town characters: Stephanie Ward, a mummy blogger (Anna Kendrick), her mysterious, stylish and rich best friend, Emily Nelson (Blake Lively) who disappears suddenly and Emily’s husband, Sean Nelson (Henry Golding). After Emily calls Stephanie asking for a simple favor, Emily vanishes. In the pursuit to find her friend, secrets unravel, emotions run high, loyalty is tested, and tragedy and betrayal follow. A Simple Favor will make you appreciate your besties, and there will be plenty of group hugs when you leave the cinema. Ster-Kinekor commercial sites are situated across the country. Cine Prestige theatres are situated across the country. You can find them at Baywest Mall in Port Elizabeth, Cavendish (Cape Town), Cradlestone (Roodepoort), Cresta Mall (Johannesburg), Eastgate (Johannesburg), Gateway (Durban), Mall of Africa (Midrand), Sandton (Johannesburg), The Grove Mall (Pretoria), The Zone Rosebank (Johannesburg), Vaal Mall (Vaal), and Ilanga Mall (Nelspruit). Book your tickets now by visiting www.sterkinekor.com or download the SK App on your smartphone. You can also book at the box office. For news and updates, go to Facebook: Ster-Kinekor Theatres | follow Ster-Kinekor on Twitter: @Ster-Kinekor. For all queries, call Ticketline on 0861-Movies (668 437).